A lady was telling her neighbor that she saw a man driving a pick-up truck down the interstate, and a dog was hanging onto the tailgate for dear life! A few weeks later, her neighbor saw this truck at the local Bass Pro Shop. 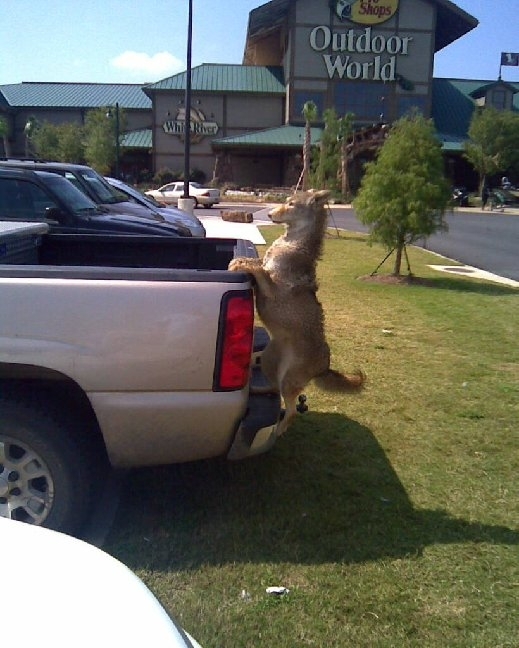 The pick-up truck driver is a local TEXAS taxidermist with a great sense of humor! Taxidermists are a twisted lot anyway! And it is not a dog in the 1st Place; it is a Coyote. Can you imagine how many people tried to stop this guy? Give Me 5. On the Side. Who Wants To Go Swimming in the Niger River?